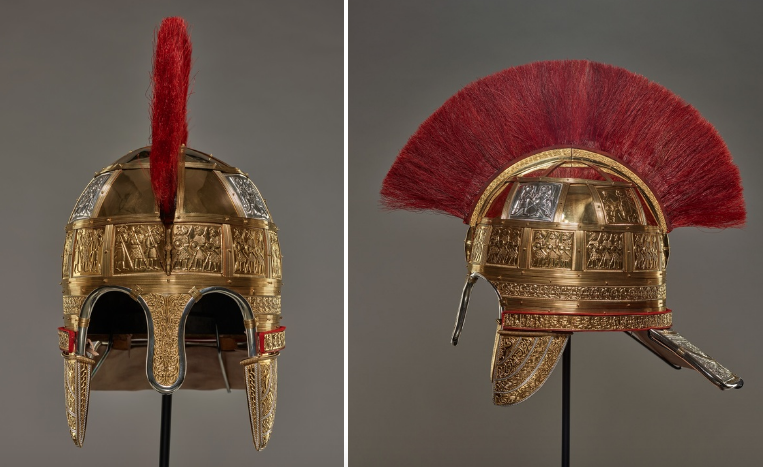 The two versions of the 1,300 year old helmet are now on display at the Birmingham Museum & Art Gallery and The Potteries Museum & Art Gallery, the museums which are home to large parts of the Staffordshire Hoard. The Staffordshire Hoard was found in a field near Lichfield, in Staffordshire, in 2009. It is the largest collection of Anglo-Saxon gold and silver ever discovered. Heavily damaged before it was buried, the seventh century treasure contains more than 4,000 precious fragments, approximately a third of which are now known to come from a single helmet. This kind of item is incredibly rare – there are only five other Anglo-Saxon helmets known. The detail and bold crested design means the Staffordshire Hoard Helmet is likely to have had an important owner. “After nearly 10 years the Staffordshire Hoard is still giving up its secrets,” says Dr Ellen McAdam, director of Birmingham Museums Trust. “Research has now shown us that the Hoard contains fragments of a helmet. Only Anglo-Saxon Kings wore helmets, and this is one of a very small number ever to be found. Much of the original helmet, including the steel base which provided the shape, are missing, while the surviving parts are too damaged and incomplete to be re-joined. Therefore, it will never be possible to reassemble the original physically. Instead, the project explored how the helmet may have been made and what it looked like, enabling archaeologists to understand its construction better and test theories about its structure and assembly. A team of specialist makers were brought in to create the helmet, including the School of Jewellery at Birmingham City University, Royal Oak Armoury, Gallybagger Leather, Drakon Heritage and Conservation and metalsmith Samantha Chilton. “This is one of the most diverse, interesting and certainly challenging projects we have ever taken on in the almost 130-year history of the School of Jewellery,” explains Frank Cooper, Senior Lecturer in Jewellery Manufacturing Technologies at Birmingham City University. Click here to read more about the Staffordshire Hoard.